Another month another 5 blog posts to share with you all. I'm going to jump straight in with a post that made me really giggle. SingleMum Speaks took me right back to the days of weaning my little ones with her tongue in cheek post 'My Contribution to the Obesity Epidemic'. I too started off with the blender, the ice cube trays filled with pureed fruits and vegetables and Spag Bol but it wasn't long before the Mini Cupcakes discovered cheap sausages, custard creams and well yes, cupcakes, seeming as I spent so much time baking this particular treat! If you need a laugh and want a flash back this is your post. Jocelyn from The Reading Residence posted What Time is too Early for PJs? A title I couldn't scroll passed simply because, if truth be told, I practically live in my PJ's! If it's been raining when I'm out I'll pop my trusty warm pj bottoms and over sized hoody on as soon as I'm home again, I may wear jeans but in the cold winter under my coat you're sure to find the same hoody or even a Harry Potter night shirt and you know what? I'm not even sorry. Share your thoughts on pj's! After a little blogging break its always nice to see a blogger pop up in my Bloglovin feed and Lisa's post was a lovely introduction to her new rescue cat Victor who will be excellent company for her other little cat Jeff. Some things never get old for me and a nice 'hello I'm still here' post featuring lovely kitty cats will always make me smile. Angela is a lovely frugal blogger who I started following last year. This post on Perspective caught my eye last month. Turning gas leaks, broken hovers and lost voices into positives is hard to think about but when you read how Angela changed her perspective it was really inspiring and I went away turning my negitives into positives also; so thank you Angela. 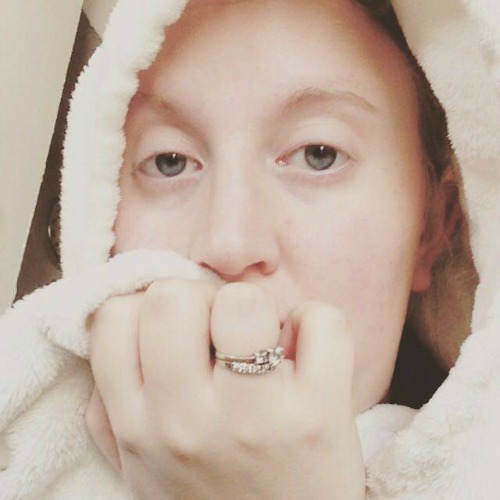 Finally, Not Another Mummy Blog wrote When We Pretend We're Fine. This post really stuck with me because I am always someone who is so happy in public, I don't moan to the school gate mums about anything really, they talk about their partners and kids, their ill health, their families and I just nod along, sympathise sometimes and act shocked at other times (some stories they come out with I tell you!) I always tell people I'm fine, always. And I always wonder if the person I'm asking is okay is really okay..are they? 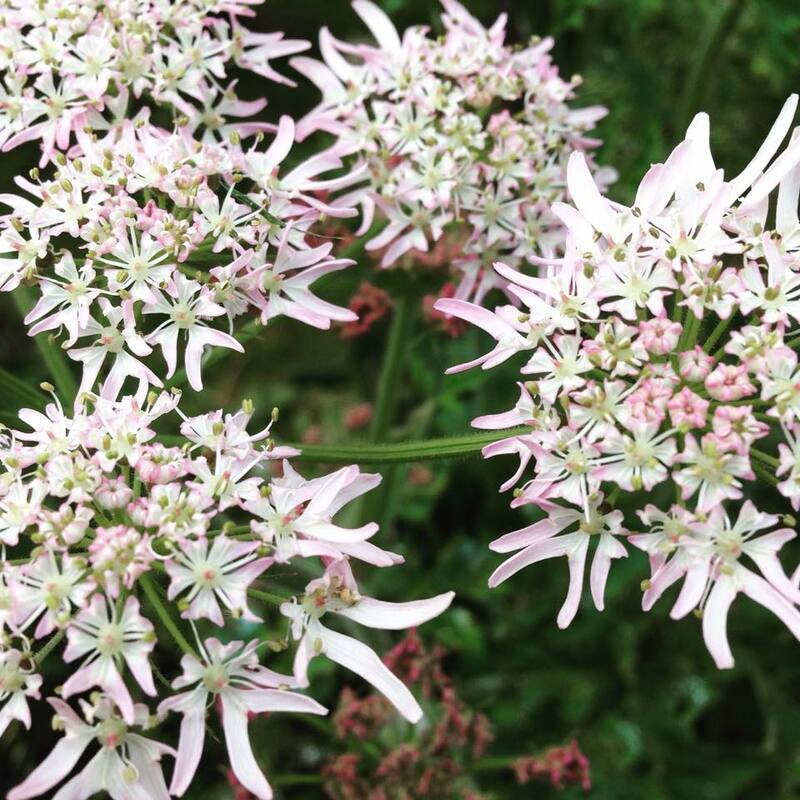 This post was a good reminder that we all have battles no matter how apparent they may be. Some people tell all and some battles you hear through the grapevine but other people keep quiet and you really don't know if they're okay. So there's my 5 blog posts for February that I hope you enjoy as much as I did. I have several lined up for March but I'm not quite done reading yet so once again you'll probably see that post at some point in April. I have always been a printer hogger at home. I used to get moaned at for using up all the paper when I was growing up, printing posters for my bedroom wall, song lyrics and of course all my coursework. When Midge was born I used my printers for all her photos instead of using online sites, but then cartridges got more and more expensive and then I moved out and never managed to afford a new printer so back I went to the library and begging parents to print things out for school route. Now things have changed! 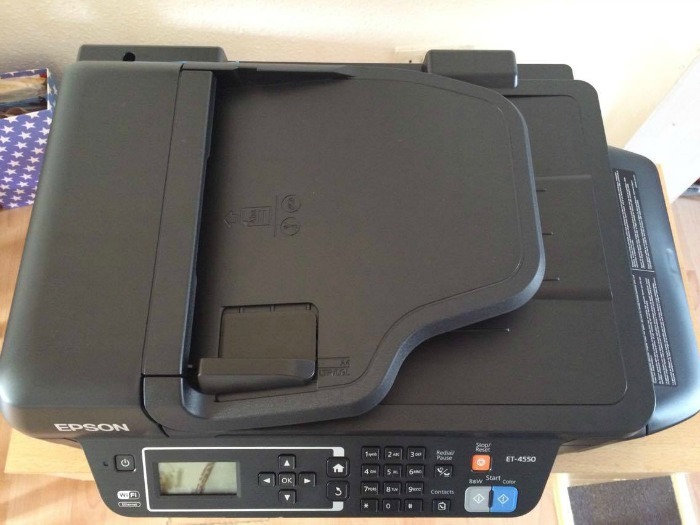 I have been sent this amazing printer, the Epson ET-4550. 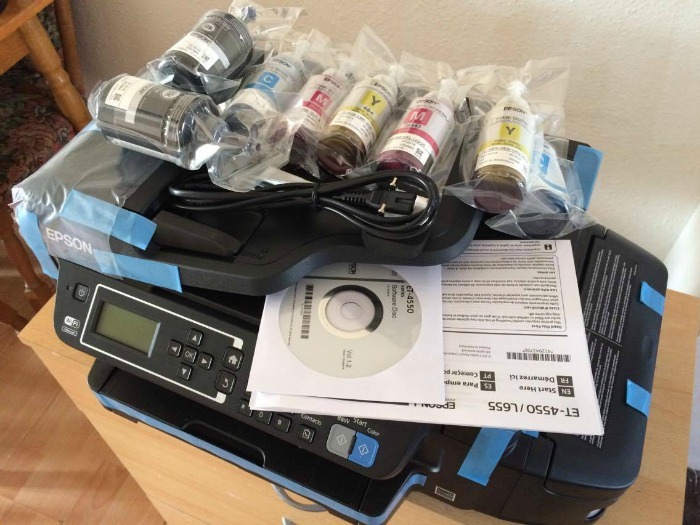 It is an Eco Tank printer, ink cartridges have been replaced with ink filters which can last up to 2 years saving you money in the long run. Already a win for me. 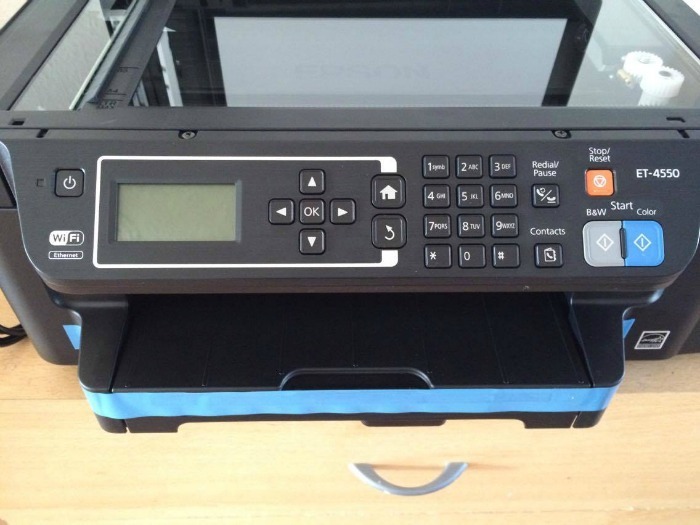 This printer can print up to 11000 pages in black and white or colour and delivers your print outs fast. When I received the ET-4550 I was surprised by how lightweight it was despite its size. I popped it on my craft drawers next to several sockets and started the set up! This printer is also a copier, fax and has a scanner too. It came with magenta, black, blue and yellow ink bottles which is where I started. I was worried I would need a super steady hand but filling the ink tank was really easy. 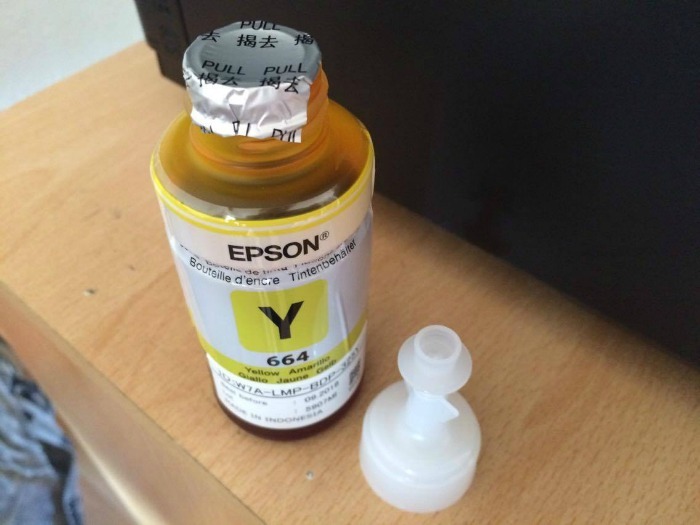 First open the ink bottle and remove the foil cover, then pop the lid back on tightly. I'd recommend doing those 2 steps then snipping the top off of the ink lid to avoid any mess. The ink tank is clearly labelled so you don't have to worry about filling the wrong ink tank up with one of the other colours. 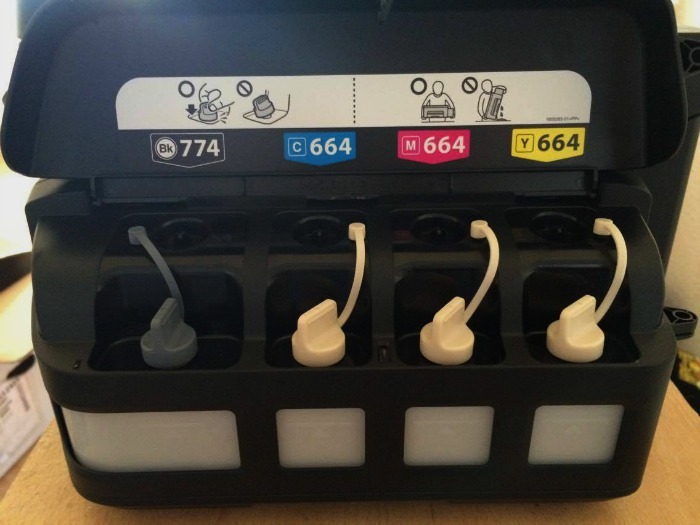 There is a clearly marked line to indicate where your ink should fill up to and then you can replace the rubber stoppers before closing the lid to the tank. 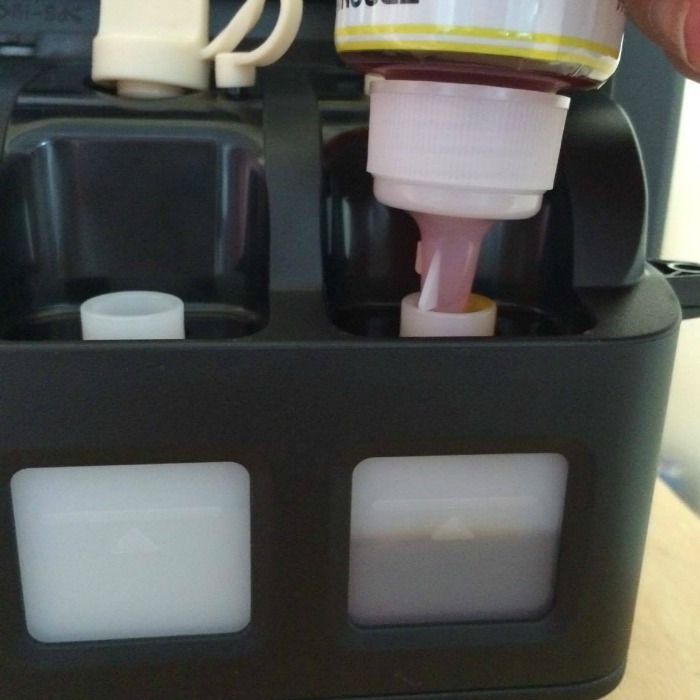 What I also found great about the ink bottles was the drip flow, this minimised spillages. Any ink I did spill was a very, very tiny amount and cleaned up easily straight away. I then plugged the printer in and set up the space around me to continue the set up process. You can set up your fax function around this point too but I haven't done this yet purely because I have no idea who I would fax! For a working office or someone who does use fax I'm sure you'd have no trouble setting it up because the instructions are very straight forward. Once set up I loaded my paper into the bottom tray for printing. We also tried the scanner at this point and it was really great quality. 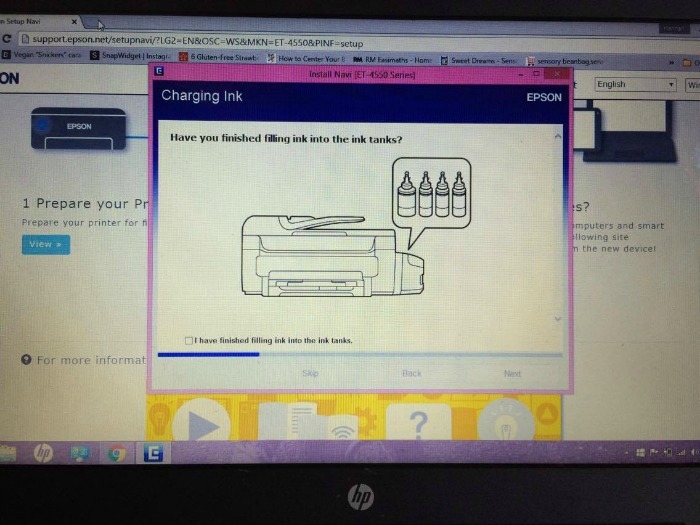 Following the instructions on the printers screen I was easily able to connect to my wifi and select layouts, paper size, quantities etc The longest part of this set up is allowing the ink tank to fill up which takes 20 minutes , I was just impatient to get started, it's really not that long to wait! The ET-4550 is WiFi connected, some laptops will recognise your printer straight away using the wireless detection and some can download the software using the disk provided with the information booklets.I don't have a CD Drive on my laptop so I searched the Epson link provided in the booklet and found the download process straightforward. I actually downloaded the software as I was waiting for the ink tank to fill so this helped waste some time! I wasted no time in printing out some documents, coupons and also photos which was the one thing I really wanted to try. 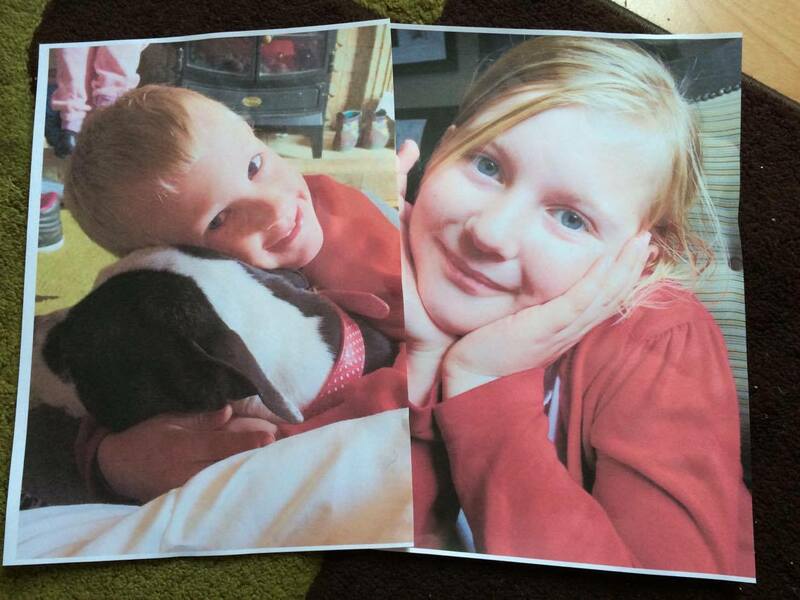 Printing was surprisingly quick and every image and document was clear. I am really pleased. As I read through the booklet I decided to try connecting the Epson ET-4550 printer to my phone. 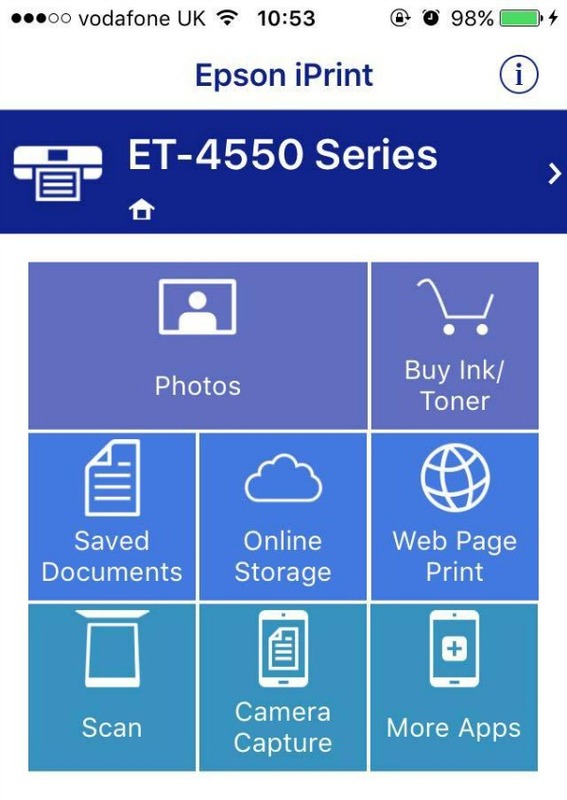 I downloaded the Epson app using the app store on my phone, (this is free), and as long as your phone has no trouble finding your printer you're well away. If you have a little trouble you can find your printers I.P address which came up on my screen during the downloading process on my laptop which helps your phone find the connection. I printed a photo and several coupons from my bedroom (2 floors up!) with zero problems. The paper tray caught the print outs so they were not on my floor when I came down, the connection didn't have any trouble considering I was pretty far from my front room and again, print quality couldn't be faulted! I have been blown away by this printer. It's the first printer we have owned in years. I know the ink will last a very long time because we don't print a huge amount. I'm pleased I can now print coupons for my shopping, the children can print out school work and I don't have to pay the library for their printing and scanning services (or ask my Dad repeatedly if he has remembered to print something important that I need!) I also have to add that I like that this printer is environmentally friendly. Not many people discard cartridges properly but now cartridges aren't a problem and I know my local recycling center take the plastic ink bottles, I can pop them out for collection and this is a plus to me. The Epson ET-4550 has an RRP of £369.99 and comes with a 3 year warranty on the Epson site. I think it is absolutely worth the money. 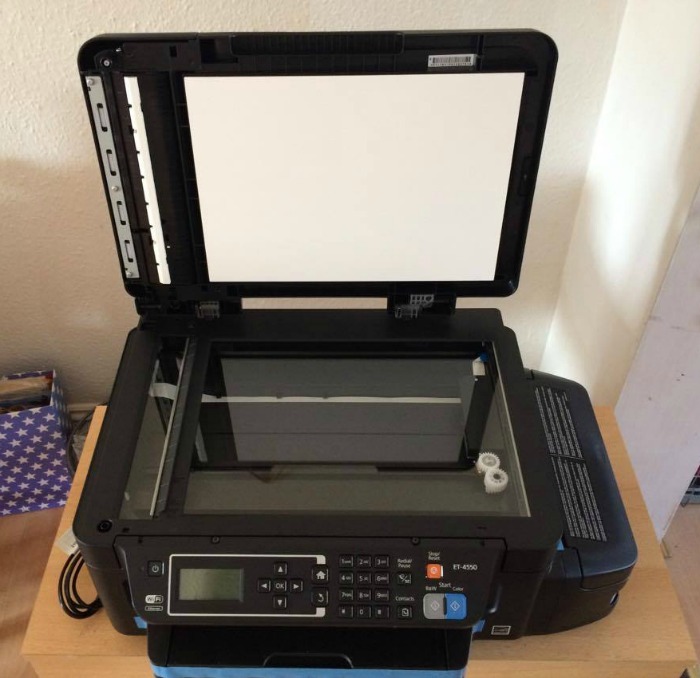 In the long run this printer will save you money on cartridges that in my experience don't last very long and these days even come with price tags as high as £20! What do you think? Would this printer save you money? Ah we're now in one of my favourite months and my favourite season is slowly peaking through the clouds to say hello...Hang in there Spring! 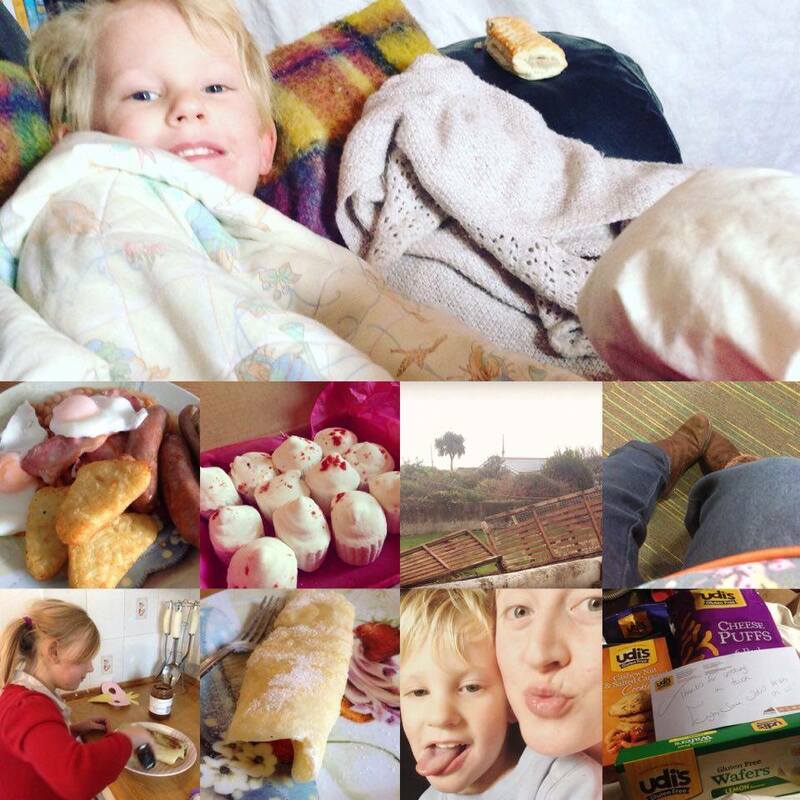 I'm so excited to see my sister back home, to eat hot cross buns, to have chocolate eggs and do an egg hunt. I hope our half term will be fun! We've had a good February and I just hope that it all continues because I'm quite content really. These teeth of mine need to behave themselves too! 1) First of all my Little Roo turned 5 last month. I totally cried the night before and maybe again when he wasn't looking, it's so bittersweet for me! We've been through quite a lot with Roo but I wouldn't change him for the world. His birthday was a total wash out but he was happy to have cake and go to Costa which is his favourite place besides the park and soft play. He spent the rest of the day playing with all his cool new superhero stuff. 2) I have, by my own admission been a bit grumpy and out of sorts. I'm a bit of a recluse these days with not really any friends or anywhere to go. Sometimes I like to do my own thing, feel lucky I can stay at home etc but other days it gets me down. Mr B made me venture out with him and Roo to play football after Roo's cool little Avengers tea party. We had a lovely walk and kick about and the dog even came along, she was ace and had a great time. I felt the effects of that day for a whole week it did me so much good! 4) Our beautiful Midge is doing great at maths getting a pen and dazzle award and her name in the school newsletter last month. Her English at school has been getting better and she's getting a bit more confident in class although her teacher says she's still too quiet. We've had some trouble with 2 other girls and Midge isn't speaking up but after a chat with her teacher I'm hoping she understands that she has to speak up to be heard and not let these girls get away with the things they are doing. Midge is really growing up and making me proud. I wish I could share photos of her because she's so beautiful but of course I cannot and would not do that..my Mumma pride is strong though! 5) We had our 6 month dental check and I'm so pleased that the children's teeth are all doing great! Midge has 1 wobbly one and Roo's are doing well with a bit of help from another dentist too. It was me who needed to book for 2 fillings and I'm still going through the works! 6) I betted on 2 random football teams last month on a betting site, something I've never done before and I won £30. Mr B was so jealous! I only went on there to do my cash-back, that win really helped me out with some things though! 8) I had a lovely day out with the children and my mum in Penzance during the half term. She bought them both ice cream, Midge got some new shoes then we went to hers for tea and several long hot baths! 9) The Dummy is now gone forever!! 10) Finally as I've mentioned a million times everywhere I possibly can, I'm happy because Spring is starting to show itself, very happy! I thought I'd best get this written and published before April crept up on me! February was a pretty good month, if a little too fast to pass but we escaped most of the bugs, only Roo was beaten by a bout of sickness after Daddy brought it home from goodness knows where! He still managed a few smiles for me despite feeling rough bless him. We had a lovely pancake day (it's not that special though to be honest because we love pancakes and have them at least once a month, sometimes for dinner and always on birthdays!) Midge of course went OTT on the sugar when I was busy cooking up my next batch! 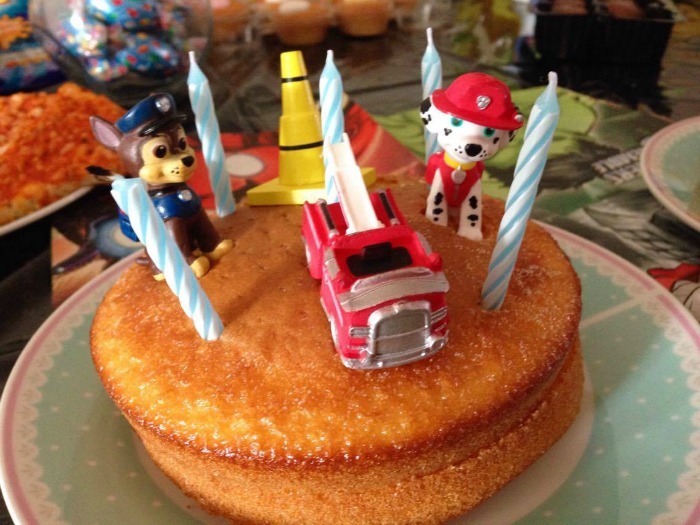 We had Roo's birthday which was a lovely day but not how we planned it at all. We were meant to go to an animal park but the weather was awful so we ended up with presents, cake and birthday Costa instead. Midge stayed at Grandma and Pop's house for a night in the half term returning with a yummy cake. While she was away, Mr B and I took Roo and the dog to the local field for some football fun and a run around. We had a lovely half term which went pretty quick and included a great day out with Grandma who bought new shoes, ice creams and dinner at her house. 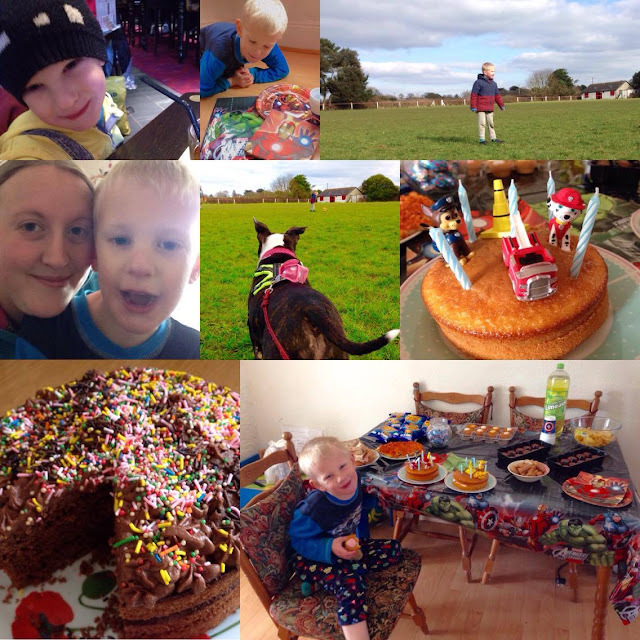 Smiles// Birthday goodies// Footie// More smiles!// Peppa out enjoying the sun// Birthday cake number 2// Midge's cake// Tea party time! Little T's birthday// Ice creams in Penzance// Hot chocolate// Happy birthday!// Birthday cake// Hapy mail!// Roo discovers Lego// A hot cuppa with the pooch// Books and Costa! I found a lovely little walk where some horses had returned and I picked road side daffodils which cheered me up. I ticked some things off the house list, next is a book shelf I think. I won quite a few prizes in February and purchased some bargain books which I enjoyed looking through on a Costa date. I wrote my bargains and wins post from January and as usual What we got up to in January. I shared my 5 Favourite Posts from other Bloggers, had a Proud Mum Moment and shared a few reviews including fun adult colouring books, a fab weekend craft box and Zoflora. Hope you enjoy these posts if you've missed them, let me know what you've all been up to as well, have you had a good February? Teeth: A Pain from Beginning to End! Once upon a time I had a lovely full set of teeth, then I had a few out to make way for braces but that was that, I was fine. Roll on a few years after children and my teeth have been nothing but trouble. I've had 4 teeth out in 3 years, not something I ever thought would happen. I've had my worst case of toothache ever over the last month and last week I walked in to the dentist and demanded it out. I had been persevering with the pain, spending a hell of a lot of time on the Internet looking up root canals, private dentists, dentists with sedation medicine available but obviously I can't afford any of that helpful stuff so I ruled out root canal reasoning that not only was I terrified of the thought of one, if I was a paying NHS patient I'd have to opt for a removal anyway because it'd be cheaper. The tooth was removed on Monday and since then another tooth wants to play games and I've developed dry socket. That's basically where the clot gets removed from the gum during the healing process so your bone is exposed. Too much information? Sorry, but not too sorry because it's in my mouth and it hurts. When you're in a lot of pain for whatever reason (I have this flu like lurgy just to make life even better) it's hard to not feel like everything is rubbish but it's not really and I'm trying not to lose sight of that. I just wish I could catch a break with my teeth. I've fallen behind on everything I love like reading, blogging and letter writing because I can't concentrate, the house, routine and meals have all gone to pot because we have a 'Mum Down' situation as I like to call it. I know my mouth will heal. I know I am lucky to have good treatment. I am hopeful my other tooth will not go the same way (actually prayed for that one to be honest) and I am hopeful that my mouth will be better for the holidays so I can be productive, fun, organised and the children aren't stuck in being bored in a pit of a house. WIN! ~ £30 to Spend Online at Party Bags and Supplies! 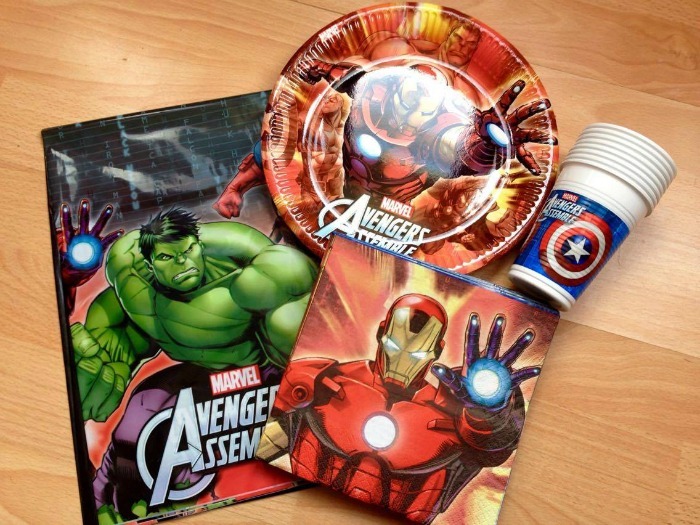 I blogged last week about Roo's cool little Avengers tea party which included a plastic tablecloth, plates, napkins and pre filled party bags all from Party Bags and Supplies. Roo really enjoyed his tea party and we were both pleased with the items from Party Bags and Supplies, I could concentrate on cake and food without worrying about finding matching items for the theme. We had a lovely day and enjoyed reviewing the products. Because we loved them so much we are running a giveaway with Party Bags and Supplies to win £30 to spend on their store online. So whether you have an Avengers fan like me, a Princess Sophia fan, Thomas Tank lover or well, pretty much anything, you can win the items you need to make your party perfect! All you need to do is read the T&C's below then follow the rafflecopter instructions to enter, good luck! Winner will be drawn from all correct entries on the closing date and will have 28 days to claim their prize or a new winner will be drawn. 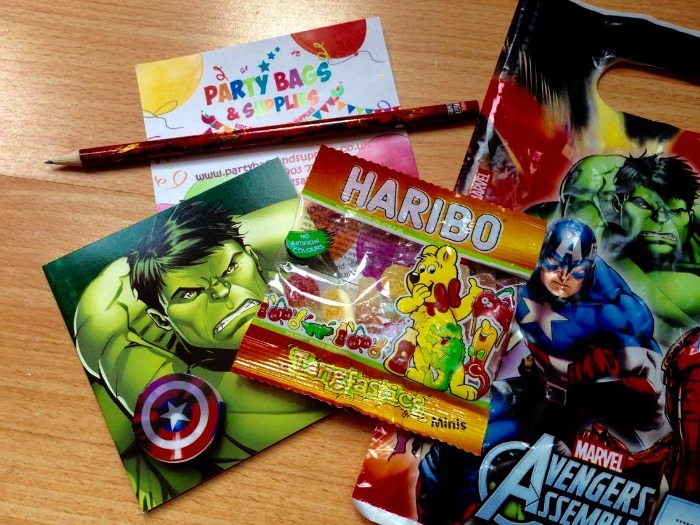 The brand/PR(Party Bags and Supplies) is responsible for arranging delivery of your prize. Midge the poor girl has always had minimal effort applied to these school events. I'm sure she would prefer to go as something really cool but all we ever managed was sodding Matilda from....well, Matilda. I don't feel bad because most of the girls at school for several years running were also Matilda so I felt some what united with the rest of the Mums at school who also couldn't be arsed. Yes! 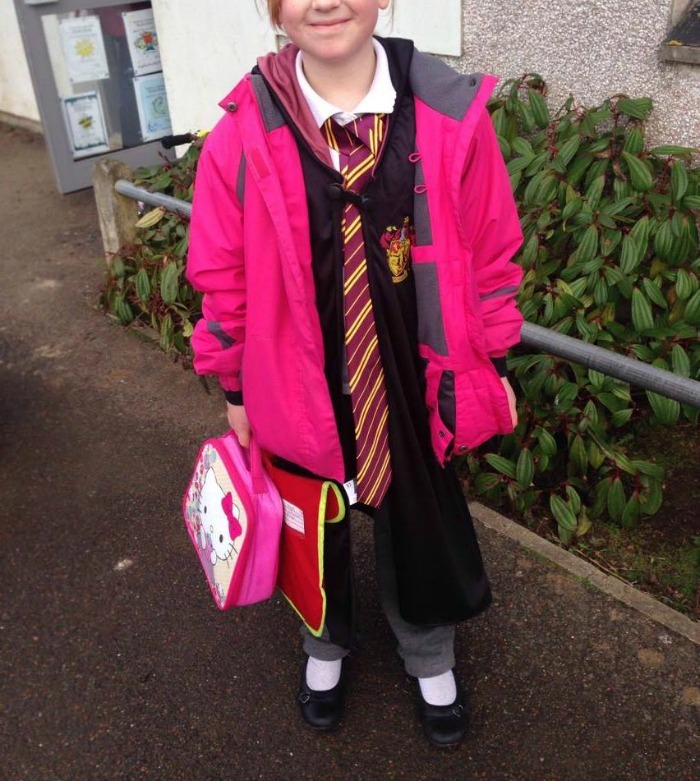 With her new Gryffindor cape and her long tie (I wish it was elasticated, it's rather embarrassing that she walked in to school and her teacher immediately did her tie because neither Mummy nor Daddy knew how to do one ha ha!) but she loved the whole outfit, and to be honest, so do I because it pretty much fits me too! I wish I remembered my scarf though! She was so happy to be Hermione and for the first time ever was really excited to go in and show off her dressing up outfit. I was really pleased with my experience shopping at Tickled Pink Fancy Dress. I received some great customer service, my parcel arrived just in time as promised and I can't really fault the costume either. As I mentioned above, elasticated ties would be better as these are very long (I suspect there's probably health and safety issues with elasticated ties though!) There is a separate clasp which connects the cape together (took me ages to find it!) at the front which is much safer than having a tie around your child's neck and it was still on at the end of the school day which I wasn't expecting. So it's a big thumbs up from both me and Midge! Thanks TP Fancy dress! Actually it's definitely me who is the stranger isn't it? I have so many posts stuffed in this draft folder it's unreal but I'm hoping I'll pull my finger out and get all of them up and out real soon! I haven't been particularly busy, I've been catching up with my letter writing and I've devoured 3 books, I read one in 2 hours and a Tudor novel in a day, I was very impressed with myself! I've been on a few walks which has been nice and most importantly Mr B has had 5 days off work this week so we have had some lovely time together. I found it so hard not to nag him about sitting down when I was doing housework but I was really good and remembered he was on holiday and that I was doing my usual routine anyway. Besides, he put up a coat hook set that has been sat in our cupboard for over a year, fixed the blind and the bed plus he put up the new net for the trampoline so I cannot possibly complain really. 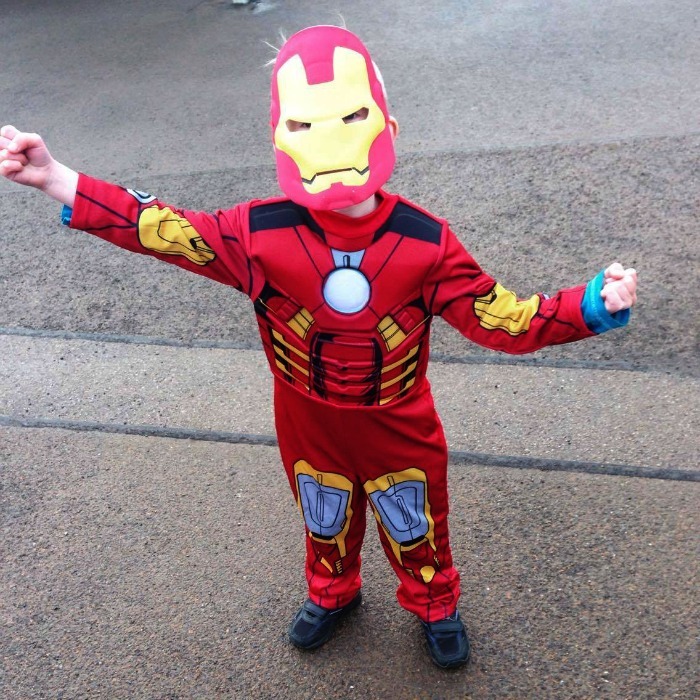 So I have some posts planned, I want to share my 5 favourite posts from February, all my bargains freebies and prizes as usual, our World Book Day costumes plus what we got up to last month and a giveaway! 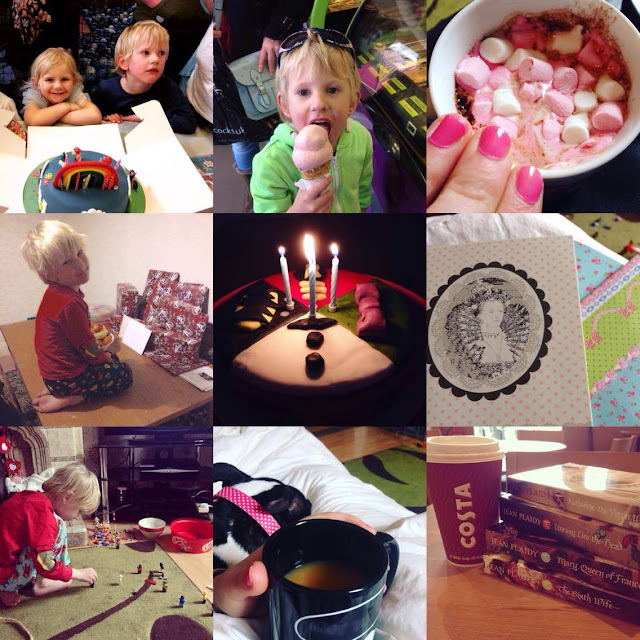 If there's anything you'd like to see on the blog please let me know! An Avengers Birthday Tea Party for Little A! To make up for the non eventful birthday I hosted a little tea party for him before we went off to the local pitch and kicked a ball around with Daddy and the dog. A is really into the Avengers and Marvel and with help from the folks at Party Bags and Supplies I put on a spread with Avengers everything! The whole pack came to about £28 and I didn't have to worry about a thing! 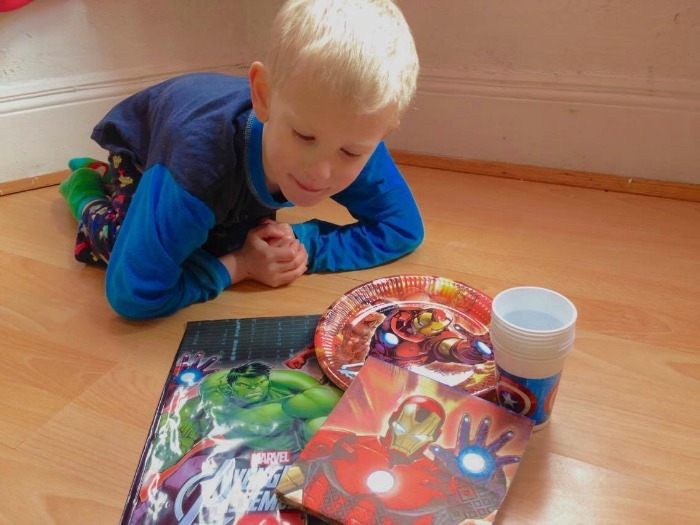 We got Iron Man paper plates, napkins and plastic Captain America cups plus a table cover featuring all the Avengers which he loved. Best of all were the 8 party bags which were all pre-filled saving me the job of going out and looking for suitable items. I couldn't find these items locally, I'd have to go online anyway so I'm pleased to have left it to Party Bags and Supplies to get the fillers! Once you add a big slice of cake the bag is a regular end of the party gift bag! 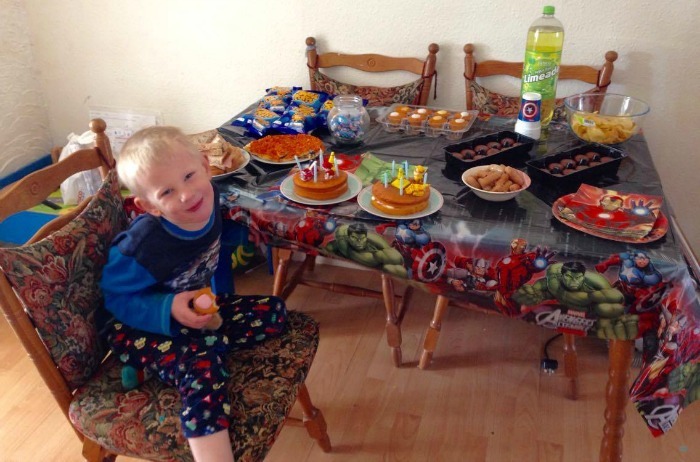 Little A was happy with his Avengers spread and goodies, he broke the theme slightly by insisting on a mini cake with his paw patrol toys stuck on top, but that's okay, it's his day after all! If you'd like to purchase this set or perhaps a different theme, check out the Party Bags and Supplies website. There are so many fab party supplies to browse plus fast delivery and friendly customer service so it's well worth a look. 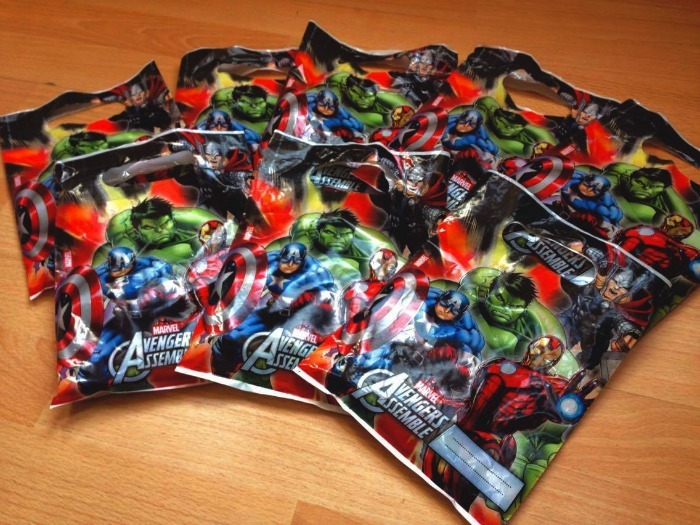 We were sent this Avengers set in exchange for an honest review and if you fancy it, why not pop back soon and try your hand at winning a Party Bags and Supplies prize? Look out for the giveaway coming really soon!